Promote your team and team events with our Team Spirit postcard design template, ideal for school, college, and community sport teams. 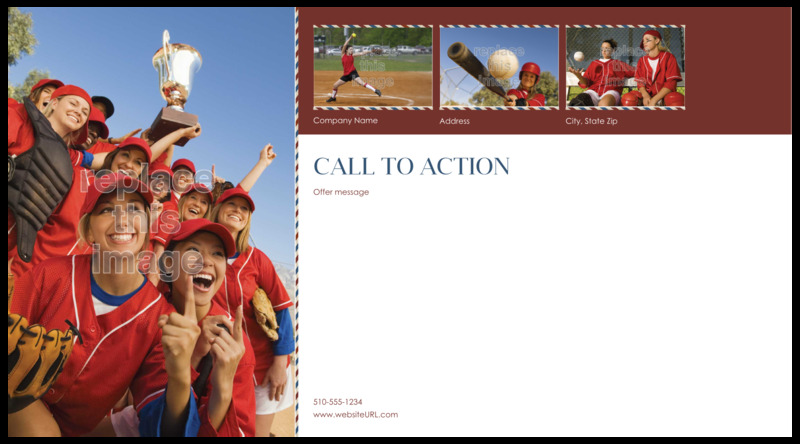 Showcase your team, team members, and special events or celebrate its successes by printing custom postcards with your team photographs and messages. Available in three different color schemes to accentuate your team colors, both the front and back sides have space for multiple images or photographs along with attention-focusing white spaces for your custom text—team name, message, call to action—anything you want. Personalize your postcard design now with our easy-to-use design tool and be on your way to printing your customized Team Spirit postcards today! Our online design tool makes it easy to personalize professionally-designed postcard templates such as Team Spirit in just minutes! Simply choose your template, layout, and color scheme, then let the tool guide you through the steps to add your own unique custom images and text elements. When you’re done, you can even print a free PDF to share with team members and get valuable input before you print! Premium paper stocks and vibrant inks, combined with fast printing turnaround and reliability, make PsPrint your best choice as your online printing partner. You can expect only the best quality when you print postcards with PsPrint—guaranteed! Our friendly custom printing team is on standby to lend a hand if you need assistance turning your ideas into actual postcards. And remember, PsPrint offers a full line of additional promotional print products to help you showcase your team, including magnets, stickers, posters, and more!